Our free integrated strategy guide will step you through 10 success factors which are deployed by leading companies to future-proof their business by creating more effective, joined-up media investments and customer journeys. With 2020 approaching fast, the guide recommends digital transformation techniques that leading businesses are using now to compete in this era of hyper-competition and increased consumer choice. Learn how to create insight-driven improvements and an aligned digital strategy, as well as future-proofing your business model. 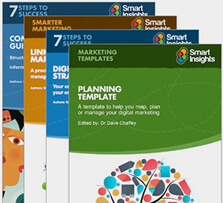 This guide recommends how to achieve excellence in marketing and suggests 'mind-tools' to help you review your approach to your marketing. The guide is for marketing leaders who want to review and update their approach to omnichannel marketing and gaining ‘always-on’ visibility online. Each success factor contains insights and ‘mindtools’ to review your approach plus strategy recommendations. Includes new coverage of omnichannel marketing, growth strategy, insights and updates to our customer lifecycle and digital marketing toolkit infographics. Dave is co-founder and content director of Smart Insights. He is editor of the 100+ templates, e-books and courses in the digital marketing resource library created by our team of 25+ digital marketing experts. Our resources used by our Business members in more than 100 countries to Plan, Manage and Optimize their digital marketing.